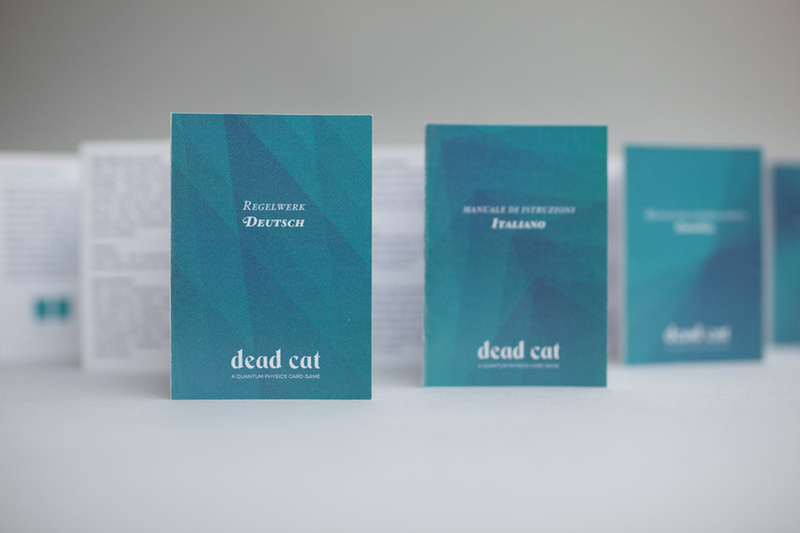 In Dead Cat you place bets on how long ago Schrodinger’s cat died. Taking peeks into the box one after the other you have to outbluff your opponent and call their bluff at the right time. Dead Cat is all about Schrodinger’s cat. You are playing an assistant of Erwin Schrodinger the quantum physicist looking after the experiment. Being the helpful, loyal assistant you are, you decide to bet with your colleagues who can guess best how long the cat in the box is already dead. A 2 to 5 players bluffing game about the most iconic thought experiment ever created. During your turn you have two options: you either sneak into the laboratory at night to look into the box and modify your bet; or you open the box and determine the cats faith and therefore the winner of the round. “Quantum Physics In A Box, The Wonders of Quantum Theory” a brief and simple introduction to the topic for beginners is included! In the box you will find the rules in English, German, Italian and Spanish.